← BAN ASBESTOS FRANCE PRESS RELEASE: Asbestos: a scandal once again! We applied the well-established, but rather under-utilized, indicator of PYLL to estimate the global burden of mesothelioma and asbestosis. All deaths caused by mesothelioma and asbestosis that were reported by 82 and 55 countries, respectively, to the World Health Organization (WHO) during 1994–2010 were analyzed. We calculated the average age at death, annual averages of the numbers of deaths, PYLLs, annual averages of PYLL, average potential years of life lost (APYLL) per decedent, each stratified by various attributes, including gender, continent, national income level and observation period (1994–2000 and 2001–2010). What is Potential Years of Life Lost (PYLL)? PYLL is an estimate of the average years a person would have lived if he/she had not died prematurely. Therefore, it is a measure of premature mortality. It is widely known that mesothelioma and asbestosis mostly affect old people. This is a fact, but this does not mean that if people die of these diseases, people do NOT lose many potential years of life. How so? On analyzing data of the 128,015 and 13,885 persons who died of mesothelioma and asbestosis in the world, we calculated that these people potentially lost a total of 2.18 million and 180,000 years of life (PYLL), or, an annual average PYLL of 201,000 years and 17,000 years, respectively. 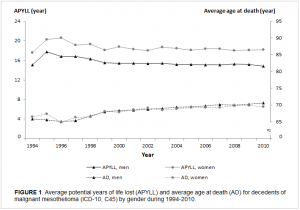 The average PYLL per decedent were 17.0 and 13.0 years for mesothelioma and asbestosis, respectively. We consider this to be a substantial loss of life, entirely preventable. As disability-adjusted life years (DALY) can be estimated from PYLL, we also compared our DALY estimates to those reported earlier, making certain assumptions. 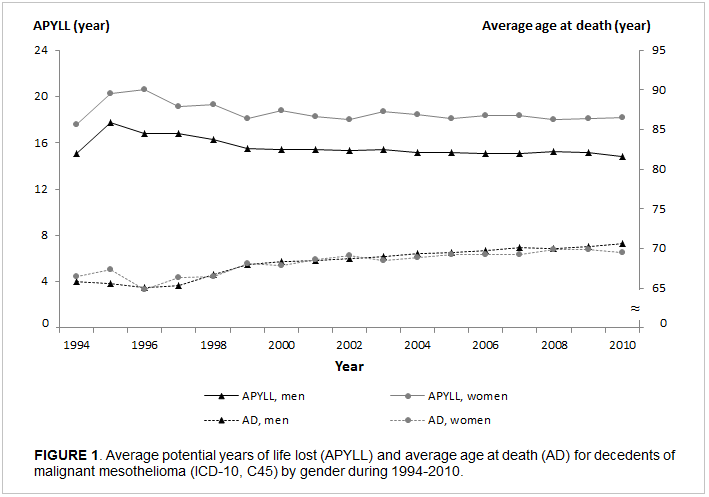 “Potential years of life lost (PYLL) caused by asbestos-related diseases in the world.” Diandini R, Takahashi K, Park EK, Jiang Y, Movahed M, Le GV, Lee LJ, Delgermaa V, Kim R. Am J Ind Med 2013. This entry was posted in Blog and tagged asbestos, asbestos-related diseases, asbestosis, DALY, GBAN, Global Ban Asbestos Network, Ken Takahashi, Mehrnoosh Movahed, mesothelioma, PYLL, University of Occupational and Environmental Health, World Health Organization, Ying Jiang. Bookmark the permalink.